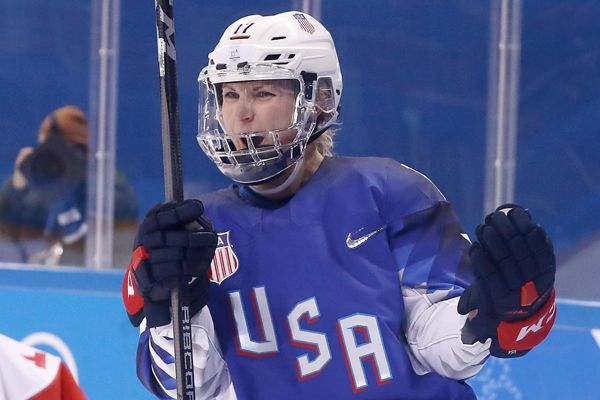 American hockey player Jocelyne Lamoureux-Davidson made Olympic history on Tuesday by scoring two goals in six seconds. Lamoureux scored the 2 goals against Russia during the team’s preliminary round. The back-to-back goals broke the Olympic record and Team USA won the game 5-0. PyeongChang is Lamoureux’s third trip to the Olympics, but she’s still searching for her first gold medal. She plays on Team USA with her sister Monique and won silver medals at both the 2010 Olympics in Vancouver and the 2014 games in Sochi. Team USA is now second in Group A with a 2-0-0-0 record and a plus-7 goal differential through two games in Pyeongchang. They’re behind Canada, which won its first two games with a plus-8 goal differential. Finishing top two in the group, which is guaranteed at this point, ensures that both teams will be placed in different semifinals for the playoff stage and sets up a probable gold medal rematch between the two teams.